Cory Booker Bad! Frank Lautenberg Good! Newark Mayor Cory Booker speaks to the audience at the Time Warner Cable Arena in Charlotte, North Carolina, on September 4, 2012 on the first day of the Democratic National Convention. The brief media bullying of Marco Rubio last night demonstrated one of politics’ iron laws: You’re either a hero or a mug. One minute Bob Menendez is a scrappy Cuban kid made good; the next minute he’s an obvious embarrassment to the Foreign Relations Committee, never ready for the job. One minute Chuck Hagel is the Wise Man of Republican Foreign Policy; the next he’s a muttering, friendless chump who crumples under questioning. A recent poll showed that most New Jersey voters approve of Mr. Lautenberg, but an even larger majority thinks his age makes another six-year term too difficult. Taxes have risen more than 20 percent over the past three years, even after the city laid off about 1,100 workers, including more than 160 police officers. Crime has risen, and unemployment is up. Schools remain under state control, and the city’s finances remain so troubled that it cannot borrow to fix its antiquated water system. While new restaurants have risen near the Prudential Center downtown, those in the outer wards were placed under a curfew this year because of shootings and drug dealing. Mr. Lautenberg, a fighter dubbed “swamp dog” by a past opponent, has embraced his job with new vigor. He has taken a leading role on the issues of the day: fighting for recovery money for his hurricane-hit state and pushing for gun control after the shootings in Newtown, Conn. He was stopped twice by constituents, then veered, like a salmon swimming upstream, toward the lobby bar. As he made his third attempt to leave, 20 minutes later, he was stopped again, by two teachers. As the conversation turned to Newtown, he thumped his cane. “We have got to bring this country to its senses.” He moved on. More people stopped him. It was close to midnight, and Frank Lautenberg was only halfway to the door. Had you read that sentence about Booker—and you could, because he’s incredibly recognizable—you’d scoff at the backslappy tone. Of course people at a Democratic Party event are eager to talk to their U.S. senator. 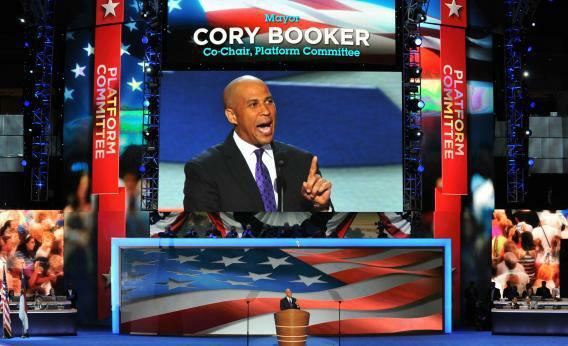 Is there no way to get real about Booker’s record—lots of charisma and little victories, lots of setbacks—without venerating the other guy?